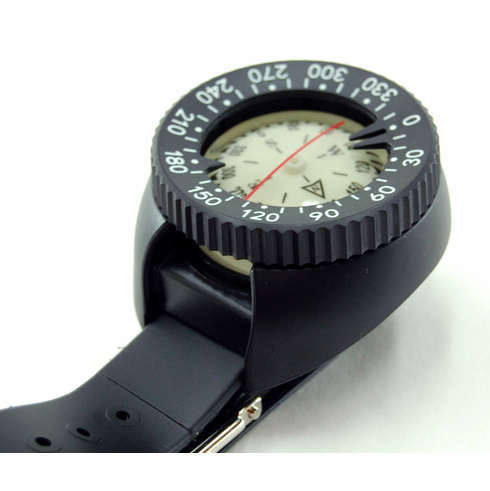 This pro-grade scuba wrist compass features a pressure resistant oil-filled capsule, perfect for any dive. The internal luminous compass card features 10 degree resolution read through the side optic, with cardinal directions visible on top. The rotating bezel features 10 degree resolution marks clearly printed on the surface with registered clicks every 5 degrees from manual rotation. The back side of the case is contoured for a comfortable fit, and the maximum 13 inch diameter of the 1 inch wide rubber wrist band easily fits over any wet suit. And the 7 inch minimum diameter ensures a snug fit of virtually any adult wrist, even without a wet-suit.